The Sino-Russian relations should both keep pace with the times, responding to new changes in international configuration, and provide common solutions to peace deficit, development deficit, governance deficit faced by all mankind, Valdai Club expert Wan Qingsong, Research fellow with the Shanghai-based East China Normal University Center for Russian studies, believes. 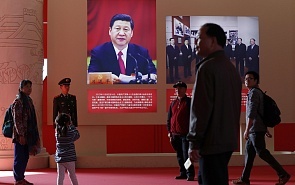 The most important decision of the address at the 19th Communist Party of China (CPC) National Congress is to define the new development goal for the next 30 years, that is, to achieve socialist modernization by 2035 and to build a socialist modernized power by 2050. In addition, the address emphasizes that the construction of a socialist path with Chinese characteristics is entering a new era. In this new era, China will continue to adhere to socialism with Chinese characteristics and follow peaceful development path. Regarding China’s diplomacy, the address of the 19th CPC Congress affirms and appraises the achievements achieved by major country relations with Chinese characteristics since the 18th CPC National Congress. It systematically puts forward policies of China’s diplomacy in the next five or more years. Among them, I notice that a new concept of “shaping power”（塑造力）is proposed for the first time. It means that China’s diplomacy will be more assertive in the future. As a comprehensive strategic partner of China, Russia is both China’s most important neighboring country and an important force for international multi-polarization trend. Taking initiatives in developing all-round positive and active strategic partnership with Russia is not only the intrinsic requirement of China in seeking peaceful neighboring environment, but also a necessity to promote more balanced development of different countries and to reform international governance mechanism. Therefore, in the next five years, Sino-Russian relationship will continue to maintain good momentum. Both countries will continue to deepen the coordination of SREB and the EEU, and further expand their cooperation. The Sino-Russian bilateral relations should both keep pace with the times, responding in time to new changes in international configuration, and provide common solutions to peace deficit, development deficit, governance deficit faced by all mankind. With regard to the Sino-US relationship, the address at the 19th CPC National Congress has not mentioned the practice of opposing hegemonism. This does not mean that China is no longer opposed to American hegemony in the world, but instead China believes that international powers are more balanced and there are more restrictions against American hegemonic practices. Since the 18th CPC National Congress, China has always advocated to develop a new type of major country relations with the US. The new type of major country relations has been mentioned again in the address at the 19th CPC National Congress, which means that China will not compete with the US for world hegemony, nor will it confront against the US. China believes that different cultures should have good communications. Major countries should have dialogues instead of confrontation. Therefore, according to me, the relationship between China and the US will continue to have dialogues and make progress on the existing basis.